The term “canted” means setting an object at an angle. Thus, “canted axles” are axles which are attached to the car at an angle. Sometimes this is done accidentally, but usually car builders cant axles in an attempt to reduce the amount of contact between the wheel tread and the track. Is there an advantage to canted axles? We will attempt to determine this with an experiment. Which type of canting (up or down) would provide the most benefit? (see Figure 1) Generally, up canting is chosen as the wheel to car body contact is eliminated, and the car body is lowered. However, the guide rail contact is increased with up canting. What is the optimum canting angle? We will attempt to determine this with an experiment. 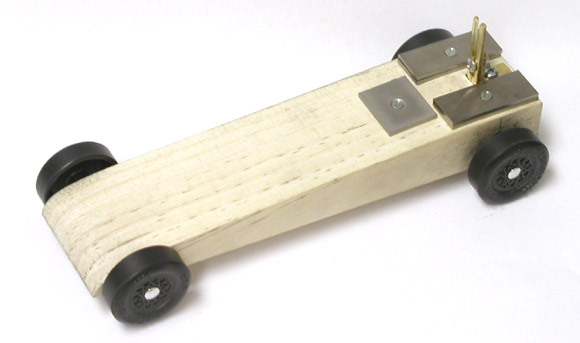 Back in December of 2003 I conducted an experiment measuring the effect of canted axles (see Pinewood Derby Times, Volume 3, Issue 6, “The Big Debates Part 4: Canted Axles”, December 10, 2003). The results of that experiment were that, in general, up-canted axles were not beneficial. These results were supported by an experiment from another person, as well as from mathematical models. 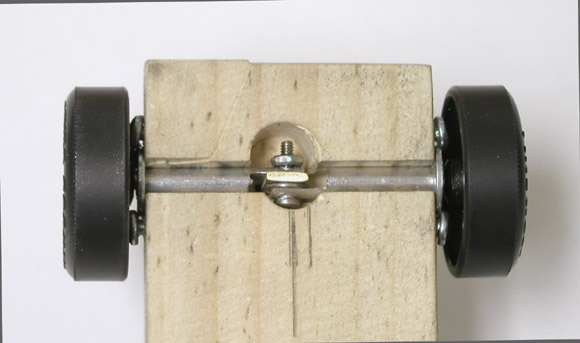 Cant angle adjusted by using multiple axle holes (axles had to be pulled and then reinserted to try a different angle. Unfortunately, this introduced experimental error. Cant angle of rear axles synchronously adjusted with a mechanism (eliminates error introduced by pulling axles, and using multiple axle holes). The main equipment for this experiment is a car with an adjustable rear cant. Figures 2 through 4 show this car. Note the fork of brass protruding out of the car. The fork is held in place by a screw into an L-bracket mounted on the car. When the screw is loosened, the fork can be moved up or down, adjusting the cant angle. 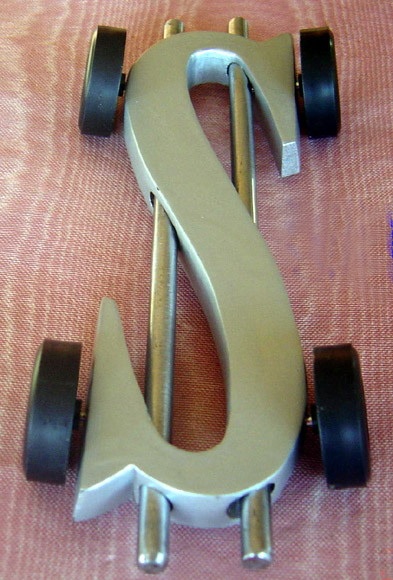 The fork from Figure 1 is connected to two aluminum tubes, which are press fitted into a slot milled into the bottom of the car. As the fork is moved up and down, the aluminum tubes synchronously move up and down. The axles are pressed into the aluminum tubes. (Note that the chip on the upper left is cosmetic; it doesn’t affect the mechanism). To force the aluminum tubing to move up and down at an angle, the end of each tube is supported by a washer. The screws hold the washer in place (I wasn’t sure if epoxy alone would hold the washer). The washer has a close fit with the tubing, so it does limit the amount of cant that can be applied to approximately 6 degrees down or up. 32 Foot Aluminum Freedom Track, the track was leveled with a bubble level and shims. The car was first aligned to rail-ride (see Volume 8, Issue 4), and then a few break-in heats were run. Then the following sequence was followed. After the heats were run, the high and low times were removed and the remaining heats averaged. The results of the experiment are shown in Figure 5. Note the time scale on the left is in milliseconds. The results indicate that there is a very small improvement in performance by up-canting the rear axles. However, note that this is not an absolute conclusion as the statistical variation of the heat times is greater than the 3 milliseconds absolute difference in times. So, there may actually be no real improvement. We can certainly say that accurately up-canting the rear wheels on a smooth aluminum track is not a disadvantage, and may provide a slight advantage. However, the benefit of canting on a rough track is unknown, but may provide a more noticeable advantage. I know most of your cars are made by boys, but this was my car at our Girl Scout Troop’s first Powder Puff Derby. Although I raced at another troop’s Powder Puff derby five years ago, it was a lot more fun having our very own. I worked on the faceplate design, and my Dad taught me how to cut the block, polish the axles, and place the weights. Thanks to your tungsten weights, slim designs like this are possible … and pretty. Our local church race was interesting this year — for me anyway. I usually try to build a nice car, but since I started hosting the event I haven’t been very careful to make it fast so that someone else can win. This year I was so rushed I didn’t even sand my car — only rough cut. About a half hour before I had to go to the race, I cut the tab off the Awana wheels, sanded around the edges to make sure they were smooth, and placed several drops of NyOil II on each axle (contrary to instructions). I then installed the axles in the original holes, made sure they had some side clearance (but I didn’t measure it), and added weights (not too accurately). The car weighed in light at 4.7 ounces. So, what a surprise it was to see my car running first! Not only was it faster than the stock cars I raced, but it was faster than the times posted by the modified cars. I saw the car fishtail on a couple of races, so I can only imagine what the car could have done with tighter tolerances and more weight. Luck? Hmmm. Riding the Rail would not seem to be a winning strategy if the goal is to reduce friction? How does this work? If you could get a car to roll down the track without contacting the guide rail, that of course would be best. But in reality, the car will contact the guide rail multiple times. 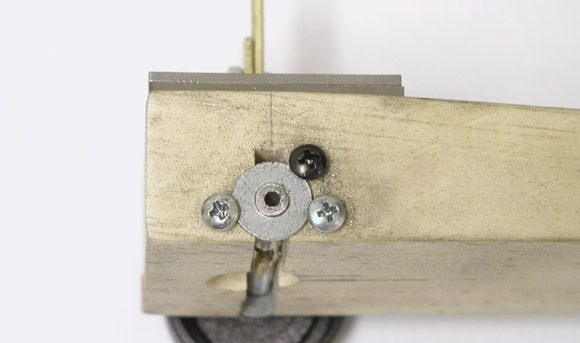 The intent of the Rail Riding is to control which wheel contacts the rail, and how much contact is present. If you use a raised wheel, to get the benefit that wheel must not contact the rail. If your weight is in the back of the car, contact with a front wheel has less affect on performance than contact with a back wheel (more weight on the back means that rear wheel contact has more impact force than a contact with a front wheel). So, the idea is to make the car contact only the front dominant wheel. Did I read someplace that tungsten putty has about the same density as melted lead? Tungsten putty (7.9 g/cm3) is denser than lead putty, but less dense than melted or solid lead (11.3 g/cm3). Please note that melting lead is a very risky. I strongly recommend using solid lead, or another metal such as tungsten.